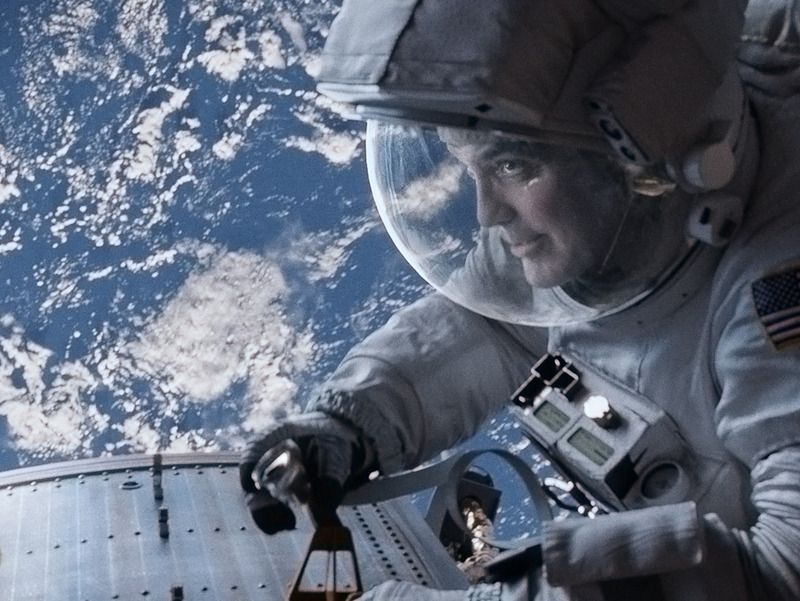 Movie Review - 'Gravity' - Director Alfonso Cuaron puts you in orbit with novice astronaut Sandra Bullock and veteran-on-his-last-mission George Clooney as their space shuttle gets demolished by debris from an exploded Soviet satellite. Critic David Edelstein says that you should watch this movie on the biggest screen you can find. In Alfonso Cuaron's Gravity, Sandra Bullock plays Ryan Stone, an astronaut careening through space after an accident. In a season in which we're all talking about AMC's phenomenal Breaking Bad and Netflix's elating Orange Is the New Black, Hollywood needs you, your kids and everyone in Europe and China to get out from behind those TV monitors and into theaters. Movie studios are falling behind on compelling narratives. But they can give you what TV can't: absolute, total bombardment. So now we get Gravity, in which director Alfonso Cuaron aims to put you right there in orbit with novice astronaut Sandra Bullock and veteran-on-his-last-mission George Clooney as their space shuttle gets demolished by debris from an exploded Soviet satellite. "Right there" means making you feel as if you're floating and spinning and bashing into things along with Bullock and Clooney — who have to find a working shuttle to get home, maybe on the nearby Russian space station, preferably before those lethal satellite pieces come hurtling around the Earth again in — synchronize your watches — 90 minutes. Time is running out. Oxygen is dwindling. Communication with Mission Control in Houston is gone — which is why Bullock and Clooney begin their messages saying, "Houston in the blind ..." There are pieces of the shuttle and dead astronauts floating all over — it's a mess up there in that airless, gravity-less void. 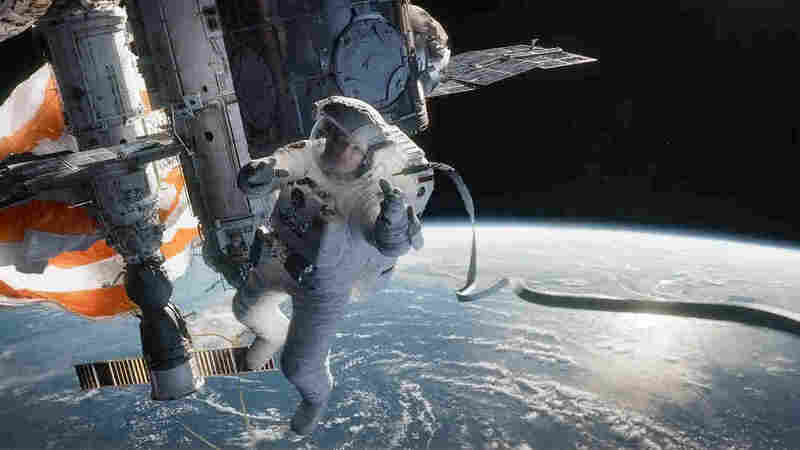 The astronauts (Bullock and George Clooney) were repairing the Hubble Telescope before their shuttle was hit with debris. Sound or its lack is essential to the illusion: fast breathing, crackles of static, high-pitched space frequencies. After the shuttle explodes, Bullock hurtles end over end into space. We see it all from her revolving point of view, Earth, stars, debris, stars, Earth ... as she calls out to Houston. Bullock is our most down-to-earth superstar, which makes her the perfect actress to connect with us from space. She talks a lot — to Clooney, to "Houston in the blind," to herself. Woven amid the bombardments and cliffhangers is a spiritual odyssey. Her character is dead inside after a personal tragedy. She needs to refind her faith and be born again — metaphorically but unmistakably, since in one shot she floats in the fetal position. Gravity has more than a dash of old Hollywood: It's sentimental as all get-out. This isn't the first time that an old-fashioned religious theme gets past your defenses via state-of-the-art Hollywood technology, but it's one of the most effective. It wasn't actually shot in space — I know, big news. But even if everything happens in a computer, it's an awesome display of math and physics. The first shot is very long and entirely fluid: a slice of Earth, a dot that turns out to be a shuttle moving toward us, faster than we anticipate, three figures attached — two working outside on the craft, one floating free. Throughout the film, I kept thinking of all the variables the filmmakers had to calculate: the way bodies drift vis-a-vis the Earth's rotation in zero gravity while stars move in the background ... the momentum and impact of an astronaut's body as it collides with another body or the side of a spacecraft with a head-rocking whomp. Gravity is not a film to watch on your iPhone on the bus. You need to sit as close as you can to the biggest screen you can find — maybe a gargantuan IMAX screen. I don't think my reverence for the physics is entirely separate from the characters' religious journey. A New York magazine reader of mine quoted Einstein saying, "Scientists have a religious feeling that takes the form of a rapturous amazement at the harmony of natural law." I felt that watching Bullock and Clooney in orbit. I wish I'd worked harder in math. Gravity is not a film to watch on your iPhone on the bus. You need to sit as close as you can to the biggest screen you can find — maybe a gargantuan IMAX screen. You need to put on those 3-D glasses and rock out. The movie is cornball. But higher Math produces the Higher Corn.